Are you ready to set up your own S corporation and begin saving thousands annually in corporate income taxes and payroll taxes? You've got several approaches you can use. You can pay an attorney $1000. You can pay an online paralegal service $200-$300. Or, you can just do the setup yourself using this do-it-yourself kit. You'll save hundreds of dollars in legal or paralegal fees. And, as an extra benefit, you will also learn more about S corporations and their tax benefits. Tip: Need more information about how subchapter S corporation taxation works before clicking the "Add to Cart" button shown below? Click here: www.scorporationsexplained.com. 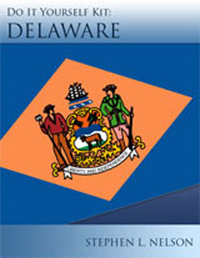 The Do-It-Yourself Delaware S Corporation Kit is approximately 20pp in length. The document describes a limited liability company’s legal and tax characteristics and then provides step-by-step instructions for preparing the LLC formation documents and submitting the formation documents to the state of Delaware. The document next provides step-by-step instructions for getting a federal tax identification number also known as an employer identification number or EIN. And, finally, the document supplies detailed discussions of and instructions for having the limited liability company treated as an S corporation for federal and state tax purposes. By the way, yes, you just read right! You should use an LLC as the platform for setting up an S corporation for the reasons explained in the ebook! The Do-It-Yourself Delaware S Corporation Kit was written by Seattle tax accountant Stephen L. Nelson. Nelson is the author of more than 150 books, including the bestsellers Quicken for Dummies and QuickBooks for Dummies. In fact, Nelson’s books have sold more than 4,000,000 copies in English and have been translated into a dozen other languages. Occasionally an adjunct tax professor teaching S corporation tax law at Golden Gate University's graduate school of taxation—the nation’s largest graduate tax school—Nelson has an MBA in finance and an MS in taxation.